I have a confession to make, I’m a closet wedding stalker. There…it’s out. Whenever there’s a wedding at Lakedale, I’m running around with a camera, taking photos of every detail, from the guests checking in, to preparations for the rehearsal dinner on the lodge deck, to the MAIN EVENT, the wedding and reception. Is the excitement of a wedding the anticipation of two families joining, or seeing what the flowers and decorations will look like, or the “aha” moment when the bride walks down the aisle and unveils THE dress? All of the above, and luckily for me, we have weddings all year at Lakedale for me to indulge in! While many bridal couples fall into the summer wedding camp, spring is a perfect time to beat the crowded wedding season and glory in the freshness of April and May. Our Wedding Point, located across Neva Lake from the lodge, is always a brilliant, verdant shade of green in spring. 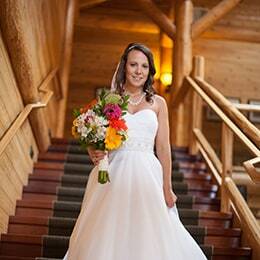 Many couples opt to either row a boat over to or back from the Point for their ceremony and then have the reception and dancing in the Great Room of the lodge or deck, with fireplaces roaring. 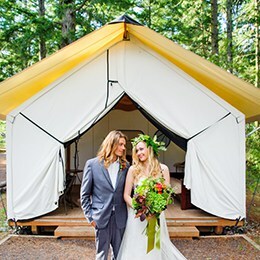 We’ve even had couples elope and get married in our glamping cabins at this time of year. June, July and August are the wedding traditional months. 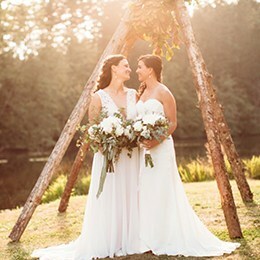 Couples can usually count on great weather in the San Juan Islands (read: no rain), numerous options for ceremonies and receptions on Lakedale’s 82 private acres, and time for family members to enjoy not only your wedding, but spend some vacation time exploring the beauty of the Pacific Northwest. 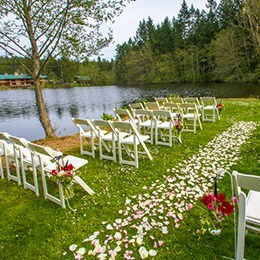 A typical summer wedding might include a wedding ceremony on the Point, with guests walking through our forested property to the Meadow for the reception. In summer, the Meadow is often blanketed in tiny white daisies. (We’re also happy to give grandma and grandpa a lift in a golf cart!) We string outdoor lights over the meadow, so you can dine, dance and party under the stars. 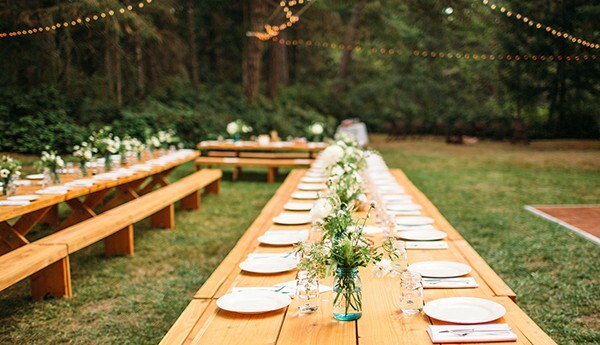 And this year, we’ve added long farmhouse tables and benches to our wedding options, for that farm-to-table experience. Fall could just possibly be my favorite season to watch weddings. September and October still have wonderfully warm weather, our trees and grasses are starting to turn golden, and there is a calm to the resort after the energy of summer. One of my favorite weddings used the entire resort for their destination wedding (for 400 family and friends) and strung 200 hand-made dream catchers throughout the resort. The rehearsal dinner was on the lodge deck overlooking Neva Lake, the ceremony in the Meadow, and the wedding reception rocked all night in a meadow near our glamping cottages. 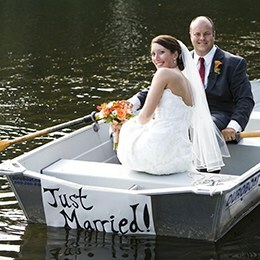 This couple really made Lakedale their own for their special day. And then the quiet season…if you want an intimate, very romantic and very cost effective wedding, winter at Lakedale is it. Whatever the weather, the lodge creates a dreamy ambiance with its stunning log Great Room, stone fireplace and enchanting lake view. One creative couple married in February, and anticipating wet weather, provided all their guests with personalized rain boots, umbrellas, and a covered tent for the reception. They ended up with a gorgeous sunny day and had a great time dancing in their boots! Whatever your season, if you’re a nature lover and are looking for a wedding venue that doesn’t involve a hotel banquet room, Lakedale could be your place. We have a fantastic team ready to help you with planning the day of your dreams! Take a peek at our website for more details (http://www.lakedale.com/wedding-and-receptions/) or click on this link to see photos of weddings we’ve hosted at every time of year…I may even be the one peeking out from behind the tree! Planning the Perfect San Juan Island Getaway!